Smarthome's new Dual-Band Insteon Dimming Lamp module is great for controlling dimming plug-in lamps. 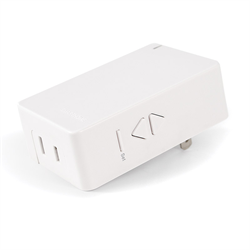 It can be directly controlled by any Insteon module including a handheld mini remote, RemoteLinc, motion sensor or automation controller. Dual band technology uses both powerline and RF wireless communication to ensure rock solid performance and it doubles as an Insteon access point or repeater, relaying Insteon powerline and RF signals to other Insteon modules in the network. For non-dimming loads/lights, we recommend the 2635-222 Dual Band On/Off module. Local Control - control the plugged in lamp locally with on, off, bright and dim commands right at the module.